Kuberblog: ... on doing something I could never have imagined I would. ... on doing something I could never have imagined I would. I don't know how I first found one particular blog in my reading list. I think it had something to do with Googling sweet potatoes. I guess I must have clicked through from somewhere somehow, and started reading the story of this girl. The next day I back-read some more, and after a few days I think I'd read through to the beginning. I liked her writing style, and I liked the sound of her life. She'd grown up in a city, trained and worked as a graphic designer, and realised that that life didn't go with a yearning in her soul. She wanted a farm. She wanted a working dog. She wanted to raise animals, grow vegetables, and make bread, cheese, and homebrew from scratch. She wanted to play her own music. She wanted to provide for herself. Slowly, she set about it. She rented a homestead. She bought chickens and fiber rabbits, started playing the fiddle. Now, not quite thirty, she's written three books and has purchased her own farm in the woody hills outside Cambridge, in upstate New York. She has two milk goats, a flock of sheep, three geese, a turkey (at least until Thanksgiving), a bunch of chickens, meat rabbits, two piglets, two huskies, a border collie, a new kitten, a tiny ex-Amish working horse and a strong black Fell pony who looks like a unicorn. 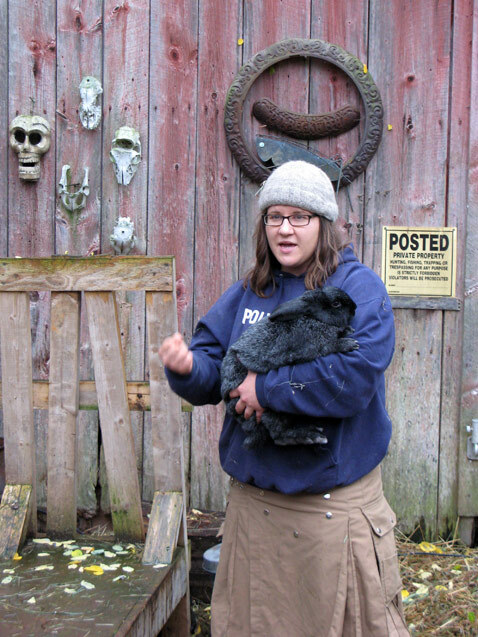 The girl is Jenna Woginrich, and she lives at Cold Antler Farm, and I went to visit. This was one of those adventures that was unlikely. Fortuitous. Blessed. Incredible. Knowing I'd be visiting New York and feeling particularly brave one morning, I'd emailed Jenna to ask if she needed any help on the farm for a day or so. Turns out that my visit could coincide with Jenna's annual workshop weekend, Antlerstock. These days Jenna doesn't go to work as a graphic designer. She supports herself and her farm with her blog, by guest-speaking, and by holding regular workshops about homesteading and farming. I promptly bought a ticket for the weekend, looked at a map, arranged a rental car, and smiled. A lot! So, on a Friday afternoon, I drove north from New York City. How I would have got through that maze of roads leading out of the city without the GPS I don't know. 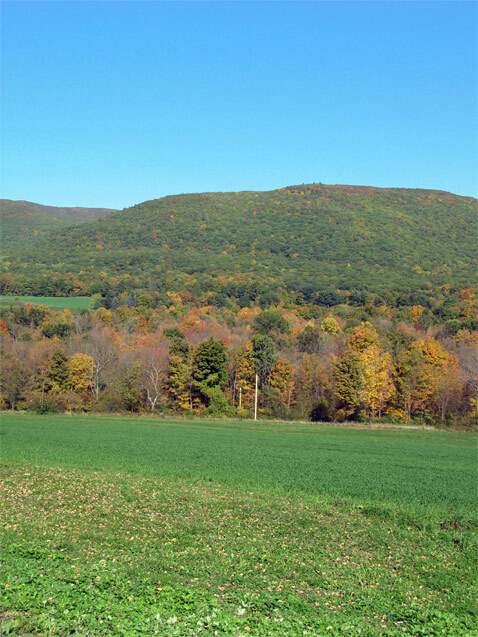 The country was low wooded hills, rather incredibly cloaked with trees doing their crazy red-and-yellow autumn leaf thing: something I never thought I would ever see. Sometimes I passed through little towns where everyone had decorated their porches and yards with Halloween things. 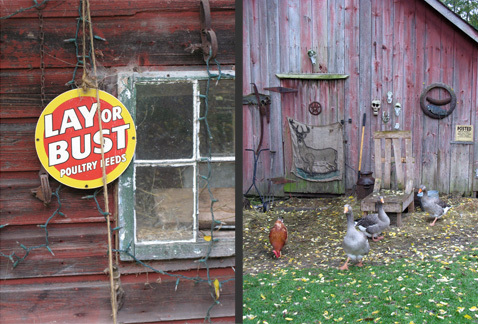 The further north I got, the more frequent the little roadside farm-stalls became. Handpainted signs read 'Raw milk sales' and 'Farm-killed meats'. The communities didn't look prosperous, but they seemed full and alive, and the soil was rich and dark. It took just under five hours to get from New York City to Cambridge, where I'd be spending the next two nights in a motor inn. The next morning was mild, but overcast. It was with some nervousness that I set out for Cold Antler. After all, I'd been reading about this place for ages, and suddenly... what the hell? How could it be that I was about to visit?! Incredible! I drove there thinking about the wonder and immediacy of the internet, and about how small it can make the world feel sometimes. I don't know what I was nervous about. Others were arriving as I did, and there were about twenty people standing about on the front lawn in front of the little white farmhouse in a clearing in the woods. I headed for the familiar-looking girl in a utility kilt who was greeting the arrivals in turn. "Who's this?" she said as I came to the head of the queue. I told her, my Australian accent sounding weirdly false in my own ears, and she said "Ooooh!" and gave me a big hug. She told me I'd won the (metaphorical) prize for being the person who'd travelled from furtherest away. The weekend began. Jenna ran through the plans for the day, standing in front of a target that was to feature heavily later on. She welcomed us all to Cold Antler, speaking over the voluminous protests of a piglet in a crate nearby, and every so often a yellow leaf would fall from the maple above. Down near the collection of red barns and henhouses were more trees (ash?) with smaller leaves that, when the wind gusted, would shower down in drifts of yellow. To this antipodean, the sight was amazing, although everyone else ignored it! Two days of workshops followed, and I was so engrossed I usually forgot to take photographs. There were generally two things going on at once, so you had your choice of whether you'd like to, say; listen to a talk about sourdough, and taste a loaf cooked in a gas barbeque, or; follow Brett, a man with an axe, into the woods and watch him take down a tree in a graceful and expert fashion. Everyone stopped to watch Jenna harness Merlin (the unicorn) and haul that log up the road. I watched the preparation of a barrel of home-brew, and tasted just-pressed apple cider straight from the bucket. Jenna's friend Patty arrived with Steele, her enormous Percheron horse, who she harnessed up; his responses to her voice-commands had me completely in awe, and he pulled another vast log out of the woods like it weighed nothing at all. You could tell that he really enjoyed it, too. Jenna herself did talks on keeping chickens, on rearing rabbits for meat, on sheep, she did a soap-making demonstration and was on hand to only-just catch the screaming piglet as he made an attempt at freedom from the barn, and to admonish Monday-the-tame-lamb when he became too inquisitive about someone's backpack. 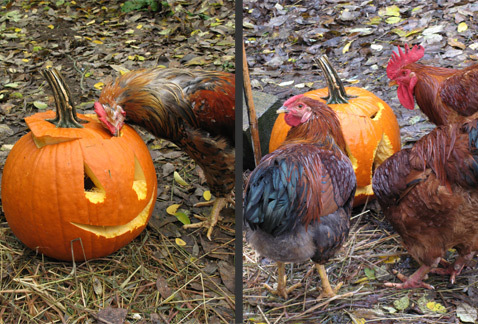 Noone could stop these chickens eating this jack-o-lantern, though. By the end of the weekend they'd (in Jenna's words) "turned it into some kind of zombie pumpkin." Inbetweentimes, we all talked, sharing stories about our homes, towns and lives. 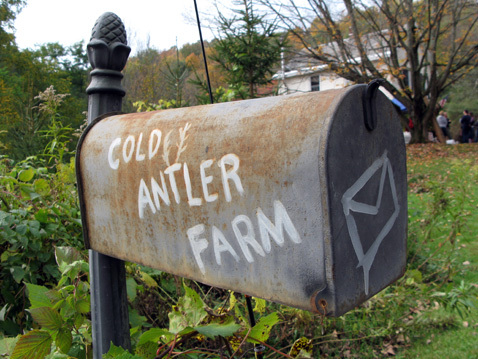 They were the most lovely bunch of folk, and I found I had something in common with all of them; we wanted to visit Cold Antler and get an insight into what life could be like if we had our own farms. The term 'homesteading' isn't really known in Australia; here we just call it 'farming' or, if we used to be city-dwellers, 'tree-changing'. The challenges are different - I simply can't imagine what it would be like to need six months worth of firewood on hand to heat my home, or to beat my way through snow to feed the chooks. But, I guess some of the people I spoke to have never faced a blistering summer of water restrictions. I'm not a farmer, nor am I a tree-changer, but the good thing was that almost everything we learned about (large livestock and tree-felling aside) could be adapted to suit a small yard in an urban setting. Now, I'm not ever likely to have a rifle leaning in my hallstand like Jenna (and hope I never need one) but at Antlerstock I did do something I never thought I would. 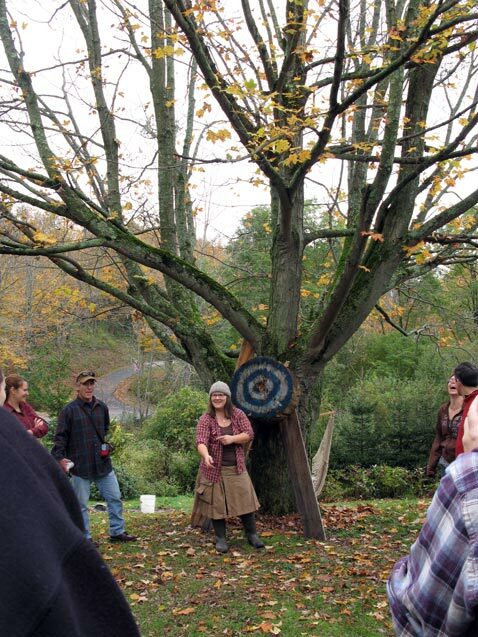 That's me, and yes, I'm throwing a double-headed axe. 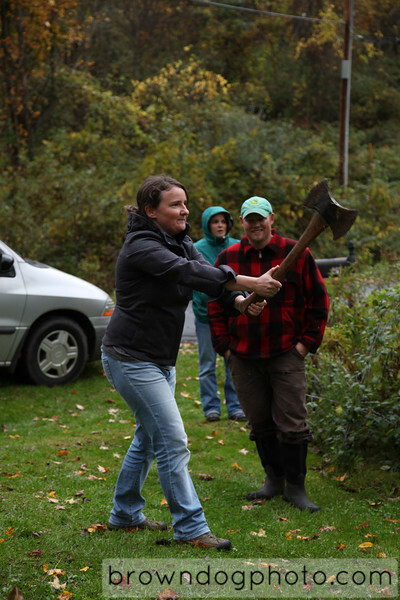 Turns out that Brett, the axe man (in the red check behind me), was a pro-woodsportsman, and axe-throwing is just one of many woodsporting events. That's what the target was for, and boy, can I see the attraction. Since I've come home, I've thought often about Jenna and her life on that little farm. I feel so lucky that I was able to visit. I'm thankful that Cold Antler has weathered the edge of the horrible recent storm that hit New York. I've started my own new sourdough culture, an intriguing experiment that I'll post on later. I've looked at my chooks with a new appreciation, and been delighted by the tiny cobs forming on the windswept corn in the garden. 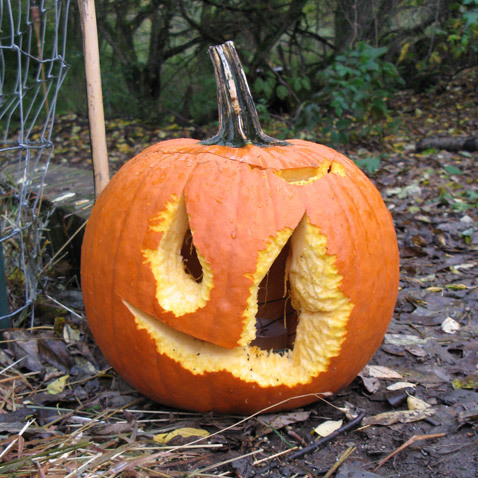 I've carved my very first jack-o-lantern. And, I'm eyeing off our woodpile and wondering what the neighbours would think if I started throwing axes around here. ... on an incredible flower. ... on learning. Always learning. ... on a bi-annual RANT!